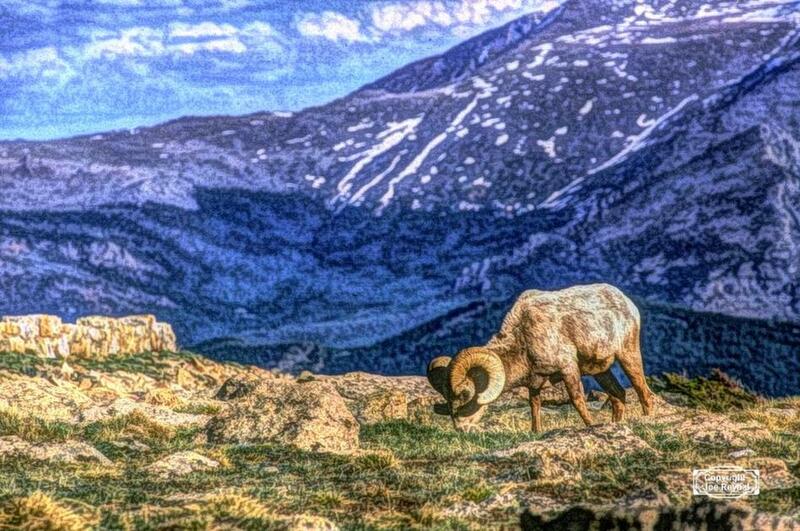 A bighorn ram at Rocky Mountain National Park taken on transparency film and adjusted in a Samsung s8 with an app to resemble a painting. A great ram-scape, Joe. I think the composition is excellent, and the mountains in the background add a lot to the image. The painting software also provided some very nice texture to the image. I'm curious, did you photograph the transparency with your phone, or upload it, before applying the painting app? I'm curious, did you photograph the transparency with your phone, or upload it, before applying the painting app? Click on image for best view. Thanks for the procedure, Joe. I remain amazed with the new phone technology. Well done. Very nice texture used here- really adds interest to an already fine photo. (Thanks for showing the original). Lovely original with a real sense of depth to the scene. For me, the paint effect with its mottled appearance brings the background forward, and that great feel of depth is gone. Just my 2 cents worth, Joe.